The recent West End revival of The Ruling Class has reawakened interest in its writer, Peter Barnes, which could perhaps have been the inspiration for this production of a play that first appeared one year later, in 1969. A satire of religious icons and teachings, it is a very weird affair indeed. Similarities with the irreverent humour of Life of Brian, bring the description “Pythonesque” immediately to mind, but the play preceded Monty Python’s first television series by a few months, so maybe it could have been Barnes who influenced the Pythons, or maybe there was just something rather strange in the air in 1969. St Eusebius is a monk living a solitary life in an Egyptian desert cave, wearing just a loin cloth and shackles. We presume that his jailer has to be God who must then bake the bread that forms his daily diet, along with water and seven olives. When St E eats the olives one by one and spits the stones onto the floor, we get an indication, before a word of the play has even been spoken, that director Mary Franklin will not be too inclined to hurry things up. 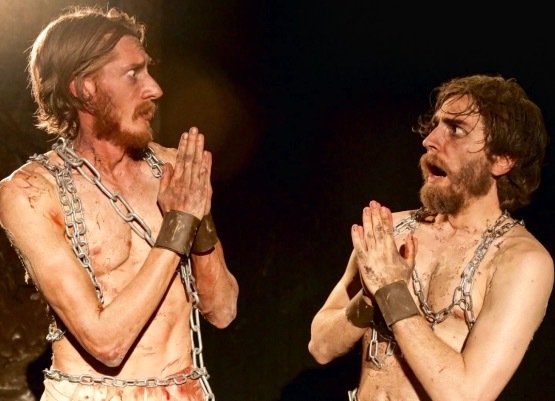 The play is under 90 minutes long and the first 30 of them are taken up by a protracted monologue from St E, ranting (occasionally in Latin) and expounding on the strictures of his God-fearing lifestyle. Jordan Mallory-Skinner attacks this with gusto and, if we are told nothing else, it becomes obvious that this is a highly talented actor in search of a much better role. The arrival on the scene of St Pior (Jake Curran) sets off what has been a common feature in the history of religion – a territorial dispute. St P, also in loin cloth and shackles, claims possession of the cave and much brow-beating (literally), flagellation and unarmed combat ensues. The action sequences are extremely well staged and inject much needed life into an otherwise plodding production. There may be just enough humorous material in this play to make up a 10 minute Monty Python sketch. If there is more, Franklin’s production does not find it and the two actors, forced to play most of it straight, are left looking very exposed. With ventures such as Joe Orton’s “lost” play Fred & Madge and Diary of a Nobody, the young company Rough Haired Pointer has specialised in unearthing obscure works and having great fun with them. Unfortunately, in this case, we have to ask whether Barnes’ play is really worth all the obvious effort that they have put into it.